About 20 days after you get married your wife (or yourself if you're playing as the girl) will begin to feel ill. At the Clinic, Alex will let you know that you'll be expecting a baby! Hooray! The pregnancy lasts for 2 seasons. When the time is right the two of you will end up back at the Clinic, where you'll wait a bit for the child to be born. At the Clinic, Woody will also appear and give the three of you a new Baby Crib. The crib can be placed anywhere in your house like any other piece of furniture. 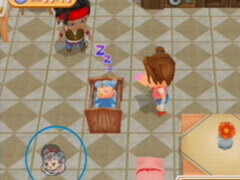 The child will stay in the crib for a while, but you can pick him up by pressing the A Button. 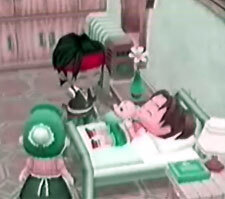 Inside your Villagers summary menu you'll find a heart meter for the child. If you want to make the baby happy you'll have to pick it up every day, and play with it using the Rattle and Picture Book you can buy from the Junk Shop. You can also feed the baby meals like Milk. When the baby cries it makes a horrible, screeching noise so try and comfort him as quickly as possible! Eventually after about 2 more seasons the child will grow to a second stage. After a visit to the Clinic he will be able to walk around, and he will be out of his crib when you wake up in the morning. You can still put him in the crib if you want to force him to take a nap, and he will quietly sleep there until you leave the house. When you come back inside he'll be back sitting at the foot of your bed again. You can even abuse the child by dumping him outside, but he always seems to find his way back home. Once the child has grown to the toddling stage he won't mature anymore and stays at that stage forever.